Workplace technology is rapidly changing and evolving, what's ground breaking one day is old news a couple of months later. So what if you could integrate the latest technologies every couple of years and have it maintained without the upfront financial burden of purchasing brand new equipment? With our Technology-as-a-Service program with ASD® you have one fixed investment and a total low voltage technology infrastructure that is fully supported. Now you don’t have to postpone or delay implementing the newest and best technology. You can enjoy productivity improvements sooner by getting the right tools for the job. Leasing gets you the technology you require while still meeting cash flow needs. Your monthly payments can include "soft" costs such as installation, freight, equipment set up, or service contracts. Since lease payments are fixed you can pay for today’s technology with tomorrow’s dollars as you earn them. Leasing is a proven way to conserve capital while acquiring needed technology. Since you're not tying up existing credit lines you'll have the capital available for critical areas like personnel, inventory, or advertising. ASD® can customize a lease plan that will fit your budget needs. Often times payments are lower than conventional financing. Preserve and protect your cash flow by freeing up your available money to work for you instead of sinking it into depreciating assets. You can choose from a variety of lease terms that suit your individual needs. ASD® will quote all of them so that you can make an informed decision. If you decide that you would like to own the technology at the end of the lease you can simply pay the amount specified in the terms. Having a fixed monthly payment allows you to more accurately forecast your budgets. The purchase price of your new technology is just the tip of the iceberg compared to its lifetime costs. Many times the maintenance of that technology can cost 3-4x more than the original purchase price. 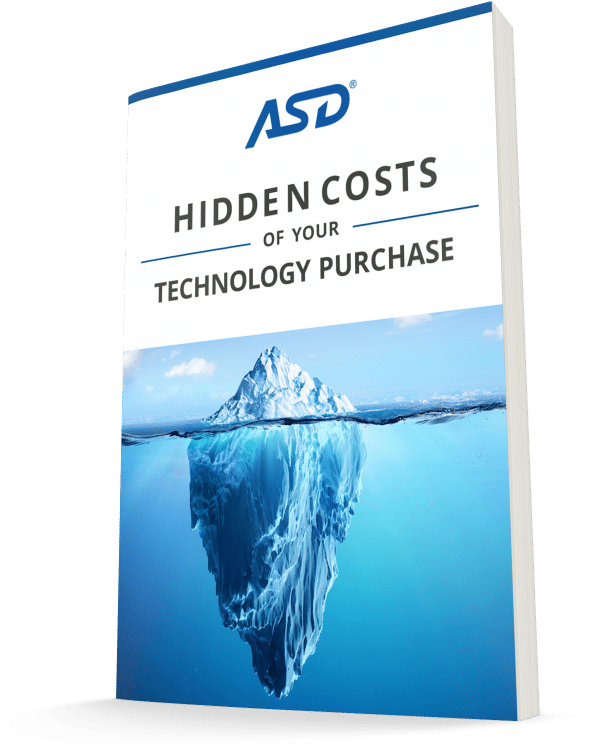 This free eBook uncovers the costs you might not expect to encounter through the life of your technology. By leasing assets that depreciate you're freeing up your cash for other areas of your business. It also keeps your funds and credit available for unseen opportunities that arise. All money is not created equal, below you will find a comparison of common workplace technology financing options. Each situation is unique and this should help you determine which solution is best for your organization. Develop your technology budget and identify the critical factors that will impact your project pricing.